The following overview enlists stock-exchange registered companies currently operating in Western Sahara. The list below is ordered at three levels of gravity, in terms of how serious WSRW assess the negative consequences of their involvement. The ordering is roughly done, based on 1) the role of the company in the operation; 2) the type of involvement (resource extraction, strategic infrastructure construction etc); 3) the length/scope of the involvement. The methodology and overview is under construction as of January 2019. Do you need more information about particular companies, contact us at investors@wsrw.org. Please know that the search engine on this website (the little window on the right column of this website) works excellently. OCP is a state-owned Morocco phosphate production and export company. Most of OCP’s operations are uncontroversial, located within the internationally recognized borders of Morocco. One mine, however, is located in occupied Western Sahara. The Bou Craa mine has been operated by OCP since 1975. OCP’s bonds were floated on the Irish Stock Exchange in 2014. The controversies, volume and value of OCP’s exports of phosphate rock from Western Sahara, is covered in the annual reports from Western Sahara Resource Watch called P for Plunder. Through the operation of the mine in Western Sahara, OCP is a key source of illegal income for the Morcocan government in the territory that it occupies. Sinofert imports phosphates from occupied Western Sahara from late 2018. The company is 22% owned by Nutrien Ltd, and 52,7 percent controlled by the Chinese government-owned Sinochem group. WSRW contacted the company on 19 January 2019, and not yet received a response. Coromandel is the second biggest phosphatic fertiliser player in India and is registered on the National Stock Exchange of India. The company received a cargo of phosphate rock in January 2019. WSRW contacted the company, and has not received a response. Registered on the Alternative Investment Market (AIM) in London, San Leon Energy, holds a petroleum agreement onshore Western Sahara. San Leon undertook the first ever oil drilling onshore occupied Western Sahara in 2015. Thousands of refugees protested the company’s operations. In 2016, the Norwegian Government Pension Fund Global, excluded San Leon due to its “particularly serious violation of fundamental ethical norms”. In october 2018, a complaint was filed to the National Contact Point of the OECD Guidelines for Multinational Companies in Ireland, regarding San Leon's breach of respecting the Saharawi people's rights. Siemens in 2012 announced that it had won several tenders of the Moroccan government for construction of wind parks in occupied Western Sahara. The parks are commissioned by Morocco’s national agency for electricity, ONEE. Siemens collaborates on all projects with the Moroccan wind energy company NAREVA – which owned by a holding company of the King of Morocco. Several new projects have been won and commenced since 2012. Most controversial of all the Siemens constructions, is the Foum el Oued wind park raised in 2013. Foum el Oued, consisting of 22 wind mills, today supplies 95% of the energy needs http://www.wsrw.org/a243x3614 of the phosphate mine of Phosboucraa. In other words: practically all energy required for the exploitation and transport of the phosphate rock in Western Sahara, is generated by wind mills delivered by Siemens. The green energy production is thus making Morocco’s plunder of the territory even more lucrative. In 2016, Western Sahara Resource Watch (WSRW) wrote a report on Siemens’s operations in Western Sahara. In 2018, Siemens built the 200 MW windfarm Aftissat in the occupied territory. Siemens has failed to answer questions on whether it has obtained consent from the representatives of the Saharawi people, both in letter correspondence by WSRW, by investors, and by shareholders at the AGM. The company has never responded. The company owns 22% of the shares in the Chinese company Sinofert Holdings, which imports phosphates from Western Sahara. Nutrien was established in January 2018 as a merger of the two fertilizer companies Agrium and PotashCorp, two companies that at the time together accounted for 50% of all all purchases of phosphate rock from occupied Western Sahara. The new company management announced on 25 January 2018 that all imports to the legacy company Agrium were to terminate by end of 2018. The company then announced on 1 August 2018 its coming closure of the fertilizer plant in Geismar, Louisiana, USA, which used to be operated by the legacy company PotashCorp. As of 28 December 2018, vessels contiued to arrive Nutrien, and no official statements have been issued regarding its termination, but WSRW expects the trade to have stopped, as of 28 January 2019. The company has allegedly, as late as January 2019, informed owners that no further inolvement are taking place from 31 December 2018. Swedish industrial company Atlas Copco in 2008 sold important drill rigs to OCP for use in the Bou Craa mine. Through the sales, Atlas Copco also obliged itself to provide maintenance and spare parts to the same rigs. It is not known for how many years Atlas Copco is tied to that contract. 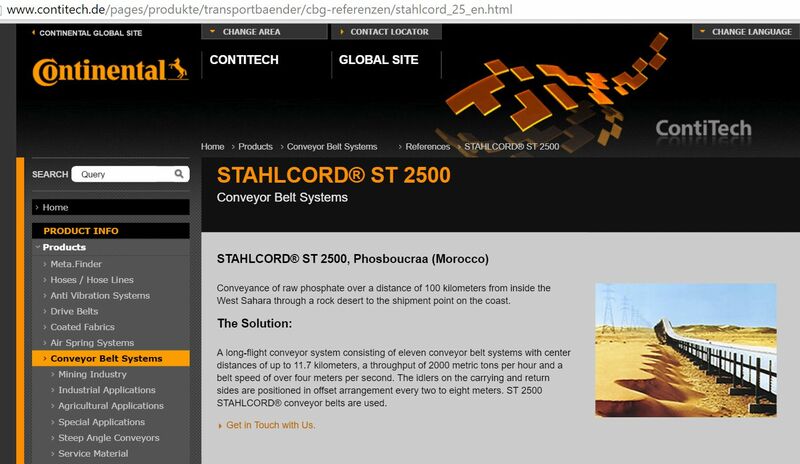 Western Sahara Resource Watch (WSRW) first confronted Atlas Copco about its deliveries in May 2013. The company has explicitly stated that in correspondence with WSRW that it does not wish to respond questions regarding its operations, and whether it has obtained consent from the people of the territory. Read correspondence with the company. A subsidiary of German company Continental, ContiTech, plays a key role in the maintenance of OCP’s long belt carrying phosphate rock from the mine out to the sea. The company states having supplied systems allowing a throughput on the belt of “2000 metric tons per hour and a belt speed of over four meters per second”. Continental has explained that it receives continuous orders to the Bou Craa conveyor belt. In April 2017, the company began constructing belt components in a proper factory in Morocco. Enel has since 2012 taken part part in the construction of wind parks. The work is undertaken by its subsidiary Enel Green Power SpA. The role of Enel is described in the report Powering the Plunder by Western Sahara Resource Watch (WSRW) in 2016. Swedish-Swiss company ABB was selected to build the first hybrid substation for a wind farm in Western Sahara. The company declared on 7 July 2017 its operation, but without specifying its location. Find the original press release here. The work relates to the construction of Morocco’s so-called Aftissat wind farm. ABB confirmed to the association Terre des hommes on 11 June 2018 that the power station was indeed intended for the Aftissat wind farm in Boujdour, Western Sahara. See also NZZ. Operates a cement factory near El Aaiún, the capital city of Western Sahara. Western Sahara Resource Watch has confronted the company regarding the operations, but no response has been received by our association. Operates a grinding unit for cement in El Aaiun. See also NZZ. WSRW has so far not confronted the company. French bank with office in occupied territory. Complaint lodged by Polisario against the company with the State Prosecutor at the High Court in Paris on 18 October 2018. WSRW has so far not confronted the company. The Moroccan bank has a large market share in the economy of the occupied territories, they boast of “having almost a 25% market share in the Southern Provinces”[or download], with 8 offices in el El Aaiun, 3 in Dakhla and others in Smara and Boujdour. The bank is reportedly also building a “Dar Al Moukawli” center (business hub initiative by AWB Group) in El Aaiun, and it is opening up a fourth office in Dakhla. Attijariwafa is also focusing on supporting investment project holders as well as SMEs with public markets in the occupied territories. The Attijariwafa bank Group has a market share in the occupied territories of around a quarter in both the distribution of loans and the collection of deposits. Attijariwafa Bank reportedly gave loans to build the Aftissat wind farm near Boujdour in the occupied territory [or download]. The loans were given to Energie Eoliene du Maroc (75% owned by Nareva) who is developing the Aftissat wind farm. In 2014 the bank put up a conference to explore and attract the increasing of business activities in the territory [or download]. Main points were the potential for doing businesses mainly in Dakhla and El Aaiun (in the phosphates, fisheries and tourism sectors) and opening up the occupied territories to international businesses. WSRW has so far not confronted the company. As of 12 Dec 2018, the Moroccan bank's website enlists 8 offices in Western Sahara (4 in El Aaiun, 1 in Smara, 1 in Boujdour, 2 in Dakhla). The bank holds a partnership with the French Chamber of Commerce in Morocco, whereby they jointly train and form people in the finance sector in El Aaiun, and promote a "Club" for small and medium sized enterprises in El Aaiun (see here [or download] and here [or download]). WSCUK confronted the company on 22 January 2019. AFD has a dual status, being both a French public undertaking as an EPIC (“Etablissement Public à Caractère Industriel et Commercial”) and a finance company (“Société de Financement”) regulated by the national banking authority (ACPR). It is thus possible to invest in bonds in AFD. In 2012, AFD signed an agreement with OCP for the financing of a desalinsation plant dedicated for the basic processing of phosphate rock at the Phosboucraa installations. WSRW has never confronted the agency. The company has on two occasions struck agreements with the Moroccan government for the production of diesel generated power plants in Western Sahara. The company states it does not see the engagements as any problematic. Company equipment and operations have several times been seen in the occupied territory. WSRW has never confronted the company. In 2018, the French electric utility company won a tender for a desalinization plant in the occupied city of Dakhla, according to the news service Africa Intelligence. The tender was won in partnership with the company Nareva, which is owned by the Moroccan king's holding company. The company supposedly in 2016 signed a comprehensive agreement [or download] with the same Nareva in the renewable energy sector. According to the website thewindpower.net, the company has a co-ownership stake (together with NAREVA) in two wind farms in the occupied territories of Western Sahara: the Foum El Oued [or download] wind farm and the Aftissat [or download] wind farm. In 2016, according to its own website [or download], ENGIE announced its participation in a Moroccan university complex 13 km from the occupied capital of Western Sahara, El Aaiun. The company calls the location as “in the Moroccan desert”. In 2013, the company (at the time called GDF Suez) took part in the tender for the Tiskrad and Boujdour wind parks, but did not win it. WSRW wrote the company on 2 July 2013 regarding its participation in the tender, without receiving an answer. The letter was directed at International Power PLC from the UK - then a subsidiary of GDF Suez, today renamed Engie Energy International, and wholly owned by ENGIE. Western Sahara Resource Watch and the French association APSO wrote the company on 11.01.2019. Veolia, together with fellow French company Voltalia, bid in 2018 to develop a planned desalinization plant in the occupied city of Dakhla, only to lose out to the Engie-Nareva partnership. See here and here. The company built a 26,000 m³/day reverse osmosis desalination plant in occupied El Aaiun in 2010 (according to this Veolia presentation from 2017 [or download]). According to a 2013 press release by Veolia, the company tried to “sell its Moroccan water, wastewater and electricity services, operated by concession companies Redal and Amendis” to British private equity firm Actis. Although Veolia and Actis reached a deal the Moroccan Ministry of Interior vetoed this sale. In 2014, the company filed an update on the US Securities and Exchange Commission noting that the sale to Actis was turned down, and the new plan of action would be to sell subsidiaries Redal and Amendis back to the Moroccan government. Veolia took part in a desalinisation conference in El Aaiun in 2008. WSRW has never confronted the company. Given a contract for the construction of a cement factory in El Aaiun, 2016. WSRW has so far not confronted the company. Kosmos’s first engagement in Western Sahara began in, on a license later to be called Boujdour Maritime. Its operatorship in that license was terminated, and the company withdrew from Western Sahara, on 21 December 2017. According to a statement by the Moroccan state oil company ONHYM in January 2018, it can be interpreted that Kosmos has left the door open to return to Western Sahara. Kosmos Energy has also maintained its website www.westernsaharaoil.com on which it describes its approach to the conflict, even after it terminated its interested on the Boujdour Maritime licence. In 2016, one of Kosmos Energy’s biggest owners, the Norwegian Government Pension Fund Global, excluded Kosmos due to “particularly serious violation of fundamental ethical norms” in its oil exploration in the territory. Kosmos in 2014-2015 undertook the first ever oil drilling in Western Sahara waters since the occupation of the territory in 1975. Western Sahara Resource Watch in 2014 wrote a report about Kosmos Energy’s upcoming drilling operation. Until 2017, Cairn Energy held a 20% interest in the Boujdour Maritime exploration licence, where Kosmos Energy was operator. Cairn and Kosmos carried out the first and only oil drilling ever taken place offshore Western Sahara since the occupation of the territory in 1975. The Boujdour Maritime licence was terminated on 21 December 2017. However, a statement from the operator seems to have left the door open for a return to the territory. Cairn has not issued any statement that it does not intend to return. Subsidiary Transavia, co-owned with KLM, operates flight Paris-Dakhla. Complaint lodged by Polisario against the company with the State Prosecutor at the High Court in Paris on 18 October 2018. WSRW has so far not confronted the company. Subsidiary Transavia, co-owned with Air France, operates flight Paris-Dakhla. Complaint lodged by Polisario against the company with the State Prosecutor at the High Court in Paris on 18 October 2018. WSRW has so far not confronted the company. In its website, Orange SA’s Moroccan subsidiary Orange Maroc states having 7 offices in El Aaiún (or Laayoune, Western Sahara’s occupied capital), 1 office in Boujdour, 1 office in Smara (or Essemara on its website) and 1 office in Dakhla. Data of coverage quality in the aforementioned territories suggests that Orange Morocco has substantial infrastructure in the Western Sahara. As recently as 2017, it promoted events and cultural activities that legitimize the military Moroccan occupation of Western Sahara, and uses Moroccan colonial maps that merged Western Sahara’s occupied territories with thus of Morocco. WSRW has so far not confronted the company. In 2018, Spanish Abengoa, together with Saudi ACWA, jointly bid to build a desalination plant in Dakhla, occupied Western Sahara. According to Africa Intelligence, the duo was disqualified from the tender. Abengoa’s 2017 Annual Report (page 46), makes reference to a water project in Dakhla, without specifying whether it is the same as the tender they are supposed to have lost. In its website, Abengoa lists itself as having a “Permanent Presence” in Western Sahara. Abengoa’s subsidiary INABENSA also lists Western Sahara as part of Morocco on maps on its website. According to Abengoa’s 2017 Annual Report (page 46), the company is also involved –through frameworks contracts— in the development and maintenance of telecommunications infrastructure for Orange and INWI in both fibre optics and GSM, although it is not defined where these projects are. INWI and Orange are both present and operate in the occupied territories of Western Sahara. French insurance company with subsidiary Axa Assurance Maroc operating in occupied territory. Complaint lodged by Polisario against the company with the State Prosecutor at the High Court in Paris on 18 October 2018. WSRW has so far not confronted the company.